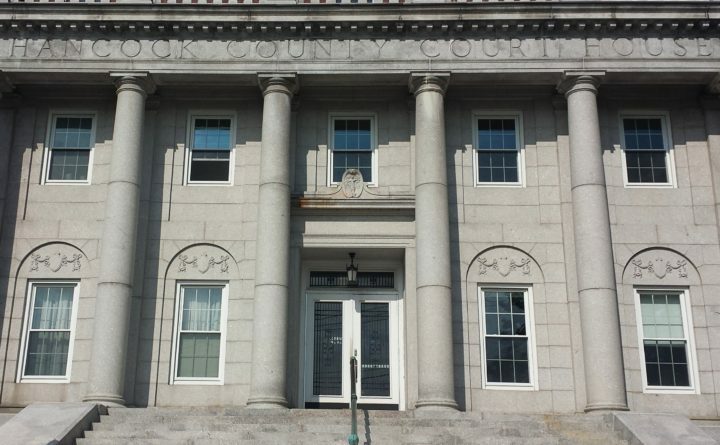 The Hancock County Courthouse in Ellsworth, Maine on Aug. 8, 2018. For the first time in at least recent memory, if not the first time ever, a Democrat has defeated an incumbent Republican to become a Hancock County commissioner. Percy “Joe” Brown, a Republican from Deer Isle who has served on the panel for 16 years, on Tuesday lost his bid to serve a fifth term on the commission. John Wombacher, a Democrat from Bucksport, received 4,198 votes to Brown’s 3,570, according to unofficial results tallied by the Bangor Daily News. Wombacher’s victory also gives the Democrats what is believed to be their first-ever majority on the three-seat commission. Since Dennis Damon was first elected in 1992 to a seat being vacated by a Republican, Democrats have represented Mount Desert Island and nearby towns on the panel. Now, with Wombacher’s winning campaign to represent the western third of the county, Democrats represent two of the county’s three commission districts. Antonio Blasi, a Hancock Democrat and the commission’s chairman, now holds the seat Damon won 26 years ago. Bill Clark, a Republican who served as the county’s sheriff from 1981 to 2014, represents Ellsworth and northern and eastern Hancock County towns. Brown, who owns a plumbing and heating contracting business, first served on the commission from 1999 to 2002 before taking a four-year hiatus. He was re-elected in 2006 and has served on the commission since early 2007. Brown said Thursday that he accepts the outcome of the race, which reflects shifting political demographics in western Hancock County. He said he will miss working with other county employees. “I wish my successor all the luck in the world,” he said. Wombacher, who works at Home Depot ,and with his wife owns a framing and photography business in Bucksport, said Wednesday that he was first inspired to run for public office by Bernie Sanders’ presidential run two years ago. Wombacher lost his bid in 2016 to defeat Republican state Rep. Richard Campbell but then set his sights on the county commission. He said he respects Brown’s 16-year tenure on the board, which he said is “to be admired,” but that the relatively high voter turnout on Tuesday shows that people are ready for a change at all levels of government. He said he had a good feeling going into Tuesday’s vote, but still wasn’t sure what to expect. “I would say I was surprised” with the win, Wombacher said. In a profile of Wombacher published by the weekly Ellsworth American newspaper, he said one of his goals in serving on the commission is to be a responsible steward for the environment. The county does not have permitting authority over wind and solar projects that are being proposed for northeastern Hancock County — the state Land Use Planning Commission and Department of Environmental Protection do — but it is responsible for working with those developers to establish community benefit accounts and in determining how to use the funds the developers would pay into those accounts. In recent years, the county has used such funds from existing wind farms to help fund local conservation projects and other nonprofit programs. Wombacher also told the American he has concerns about proposed changes to the LUPC’s 1-mile adjacency rule, which would allow for development in Maine’s Unorganized Territory to occur farther away from existing development. Brown’s term runs through the end of the calendar year. Wombacher is expected to begin serving in his new position in January.